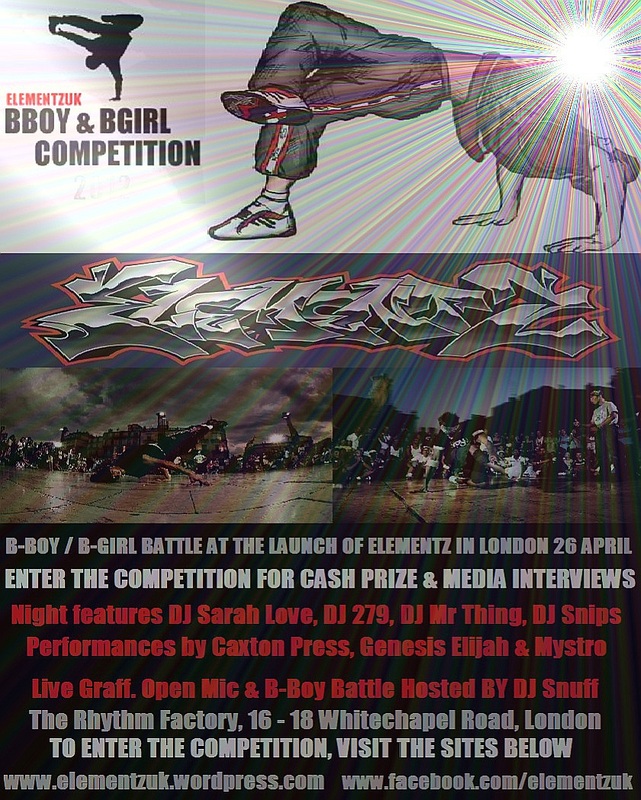 The search is on for the next big B-Boy / B-Girl acts for a battle competition at the launch of the new Elementz club night which takes place at Rhythm Factory in Whitechapel Road, London on Thursday 26th April. This is a new quarterly event representing the traditional 4 elements of hip hop to full effect. A full section of the night is also being given over to live graffiti, open mic, and a b-boy / b-girl battle with a cash prize on offer. This is being hosted by End of the Weak / Speakers Corner DJ Snuff assisted by DJ Johny Garcia. In addition to the existing line up of dancers, 7 more successful entrants will have the opportunity to take part in the battle competition on the night to be crowned Elementz Champion at the club’s first event. Only one video is accepted per entrant and all video submissions will be highlighted on the Facebook page. An email should also be sent to info.elementzuk@gmail.com with the entrant’s name & if possible, contact number. In return, an email will then be issued confirming entry into the competition. The 10 entrants with the most “likes” on their own Youtube or Vimeo video will be shortlisted. For those using an older video, a note will be taken of the number of exisiting likes at the time of submission, so only “votes” registered after submission will be counted. The 7 successful entrants from that shortlist will be decided upon by an independent judging panel. 8PM – 3AM. NEAREST TUBE ALDAGATE EAST. TICKETS AVAILABLE FOR £7 IN ADVANCE NOW VIA TICKETWEB, £8 ON THE DOOR.